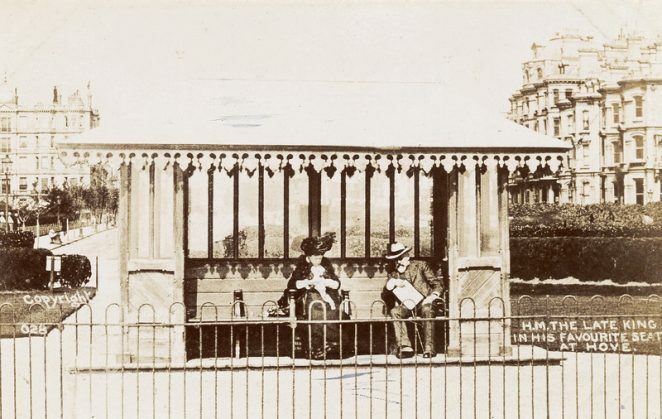 King Edward VII and Queen Alexandra relaxing on a bench at the southern end of Grand Parade, Hove. The bench was situated near the home of Arthur and Louise Sassoon in King’s Gardens, and became one of Edward’s favourite spots. After his death in 1910 it became a poignant, if unmarked, memorial. 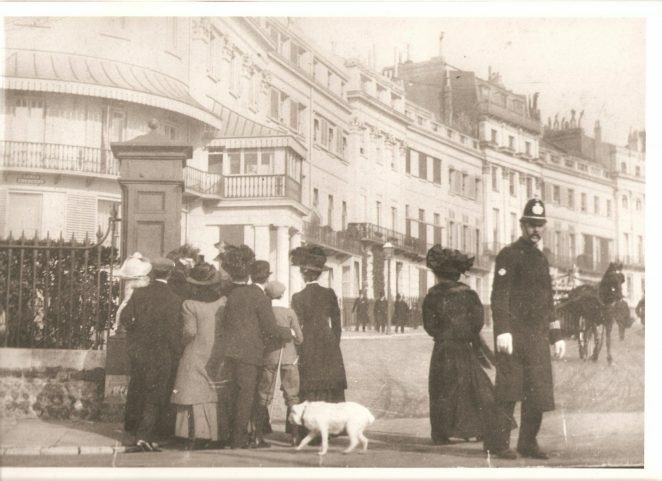 In February 1908 after a short illness, Edward VII convalesced in Brighton. He stayed for a week with his eldest daughter, Princess Louise, Duchess of Fife, at her home at 1 Lewes Crescent. Every day during his February visit the King was driven to lunch with his friend Arthur Sassoon, who lived at 8 Kings Gardens Hove in a state of extreme splendour attended by forty servants. The committee of the Kemp Town Enclosures asked the estate’s residents to give over for the King’s exclusive use, the gardens and the terrace onto the sea front which was at that time private to the estate. While many of the residents were able to see the King from first floor drawing rooms overlooking the gardens, the local people were not so fortunate and crowds came out from the town to catch a glimpse of the King coming and going from Lewes Crescent or walking in the gardens. The event is captured in a letter from No.22 Lewes Crescent at the time. Charles Cayzer writes to his father, a shipping magnate with headquarters in Glasgow. The same shelters, there are two of them, are still there today at the bottom of Grand Avenue. Its a shame 1960’s tower blocks on the west side spoil the current same view! The B&H Council offices on the east side are “quite” pleasing to the eye, but not a patch on those on in the old photo. I wonder when/why they were demolished, its difficult to guess the date of the council offices?